Rapid Response Team NASA's Aqua satellite passed over Tropical Cyclone Carlos when it was affecting La Reunion and Mauritius islands in the Southern Indian Ocean. The satellite imagery provided a clear picture of how wind shear was affecting the storm. Earlier the GPM core satellite found heavy rain and towering storms within Tropical Cyclone Carlos. 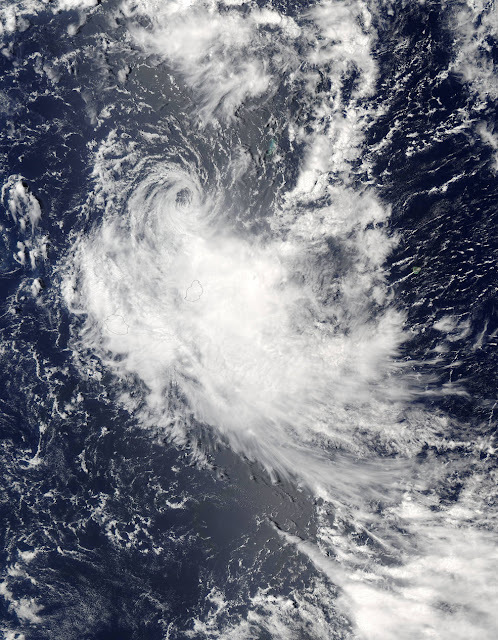 Tropical Cyclone 04S formed north of La Reunion Island on February 4 and continued to track slowly toward the island. This ended an unusual drought of tropical cyclone formation in that part of the Indian Ocean that began in July 2016. When NASA's Terra passed over the newly-formed tropical cyclone imagery showed a concentration of strong thunderstorms around the center of the compact storm. The storm was later renamed Tropical Cyclone Carlos.